My story with Furious Barrels began different than most... The Bad Karma Paintball team attended a local event produced by Desert Edge early this year. During a raffle I won a Furious LOTUS Barrel Kit for Tippmann A-5/X7 markers. I have enough paintball gear to put 10 players on a field, so gear I win usually goes into my gear room or ends up on eBay. After winning the Furious barrel (hot pink tip and .689 back), Danger Dan from Desert Edge came running up to me and told me NOT TO SELL the barrel, but to try it out first because it would beat anything I have in efficiency and accuracy. Danger Dan's recommendation carries a lot of weight, he is very knowledgeable about paintball and I know he wouldn't recommend gear he didn't believe in. I took the barrel home and there it sat on my table of 15+ barrels comprising mostly of Stiffi's a couple Freak Kits and a Dye UL, all of which I was very satisfied with and had no thought of changing my barrel to anything else. Eventually my curiosity won out, and I had to see if what Danger Dan told me was true. I grabbed my X7 Phenom, Custom Chrono X, a full tank of air, a bag of balls, and my trusty Stiffi, Freak, Dye UL and the Pink Furious and went into my backyard to test it out. I started off with the Furious LOTUS and it was chronoing at about 285 (+-5fps) for approximately 15 shots. I then put on my usual barrel, a 14" desert camo Stiffi, and it was chronoing around 260 (+-8fps) for about 15 rounds. I couldn't believe that I was getting a 20+fps increase with the Furious barrel over my Stiffi barrel. I immediately deemed it a fluke and convinced myself that the air pressure from my tank was lower after the Furious test so that was what made the difference. I ran back inside and filled up my tank, came back outside and tried the Stiffi first with the exact same result of 260+-fps. I quickly put on the Furious again and to my astonishment I was shooting 285+-fps again. I then proceeded to test it against my Freak and the Dye UL with similar results, all of my other barrels were shooting 15-35 fps slower than the Furious barrel and all of my barrels were .689 bore, so I knew it wasn't a boring issue. Simply said, I was SOLD. Ever since that day I have ran nothing other than a Furious on my X7 Phenom. The next event Bad Karma attended, I had about 5 other guys on my team test it against the barrel systems they were using (Hammerheads, Deadlywinds, J&J's etc.) and we couldn't find a single barrel that had a better efficiency/FPS than the hot pink Furious LOTUS I was using. After the testing as well as the satisfaction I have had with the Furious Barrel system, Bad Karma has gratefully been sponsored by Furious Paintball. 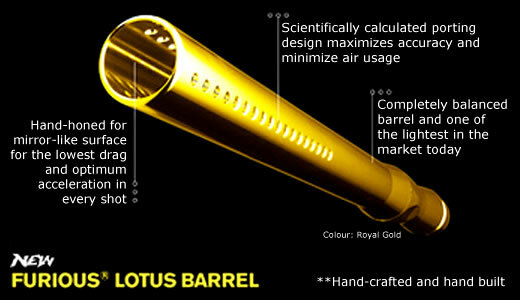 Everyone on the team has been completely satisfied with the quality, efficiency, look/feel, and quietness, of the Furious LOTUS Barrel System. We are very excited about our relationship with Furious, and as they would say, we "don't get angry," we "get FURIOUS". The single most effective upgrade that someone can do for a paintball marker is the barrel. No other upgrade can effect as many factors as the last piece of the marker that a paintball touches on it's way to meet your opponent. Over the years I've had any number of barrels. Sly, MacDev, Stifi, CP, Lapco, BT, Tippmann... All of them eventually left me wanting more out of my barrel system. I used single piece, double piece, barrel attachments. Still I wanted more. Then I got the Furious LOTUS barrel. One of the very first things that you notice when switching to the LOTUS on a Tippmann X7 Phenom is the much quieter operation. The barrel's porting is the best I've seen for noise reduction. My first thought when shooting through the LOTUS was that I was out of air. I checked my tank to see I was full up on air and then realized that the marker was shooting straight and with full power. The polish on the inside of the bore is incredible and helps make the marker a more efficient machine. I had to dial back my velocity a great deal to use the LOTUS. Another factor I have seen is vastly improved accuracy. Very tight shot patterns with the LOTUS as compared to the OEM barrel or even my multitude of aftermarket upgrade barrels. We often hear of barrels that allow you to shoot through a break. It wasn't until I used the LOTUS that I found a barrel that actually delivered on this promise. After a barrel break (which is uncommonly rare) I was able to shoot through and get most of the accuracy back in my marker. All in all it's the best barrel system I've used to date. During the first use of these barrels on the Tippmann X7 Phenom, I thought I had gun issues. The marker was shooting extremely quiet and my thought was that I was having air leaks. When I couldn't find anything wrong with the X7 Phenom itself, I took it to get chronographed and was shooting really hot, over 320 fps! I turned the velocity down and began to understand the impact the LOTUS barrel was having on my X7 Phenom. During the first game it was amazing to see how little air the Tippmann was consuming and I was able to keep the shots pretty accurate. Overall I was very impressed by the sleek design of the LOTUS, how quiet it made the X7 Phenom, the air efficiency and how accurate the barrel was. 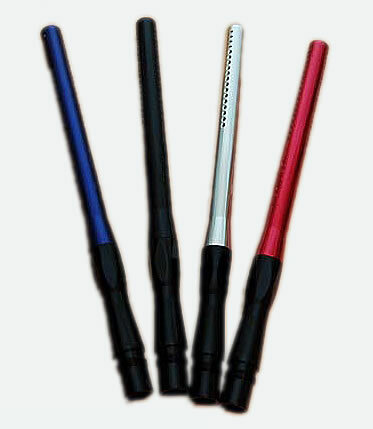 Need barrel front lengths on all colors 12", 14" and 16"
Additional color varieties would be nice, and maybe more bore sizes available for the backs. The single best barrel that each reviewer has had the chance to play with. An instant upgrade to any marker, the Furious LOTUS barrel is a stylish addition that will make an instant impact in your game. Recently, Bad Karma received our exclusive Green Furious LOTUS barrel fronts. 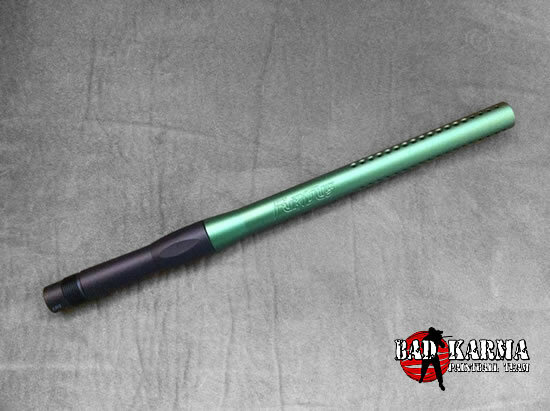 A perfect match for the Tippmann X7 Phenom, the official marker of Bad Karma.